Anyway, anime themed cafes are typical in Japan, but they are not permanent fixtures. Pop-up anime cafes are a great way to promote new a series or movie, so they usually attract a lot of fans and they don't last for very long. The one featured in this post was from 2011, so I'm sure these menu items are long gone by now. Since there is no way for me to buy any of these Madoka menu items, I decided that I wanted to make my own here in the states. 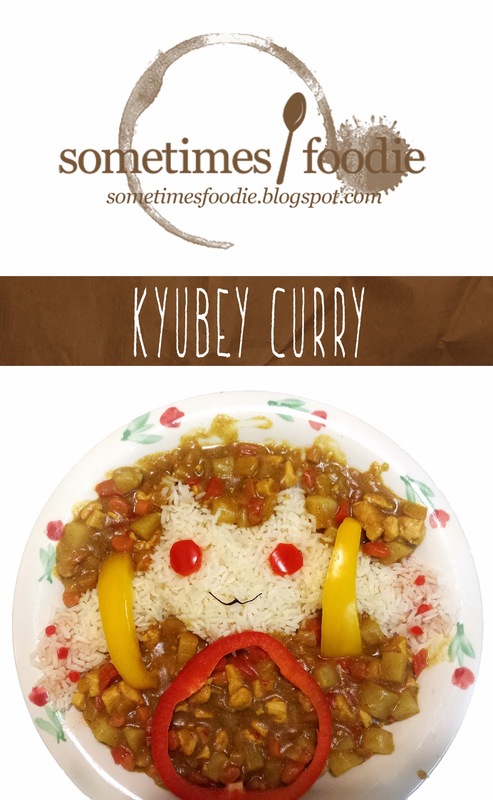 I started things off with the Kyubey Curry! All in all, this was a pretty easy dish to recreate. 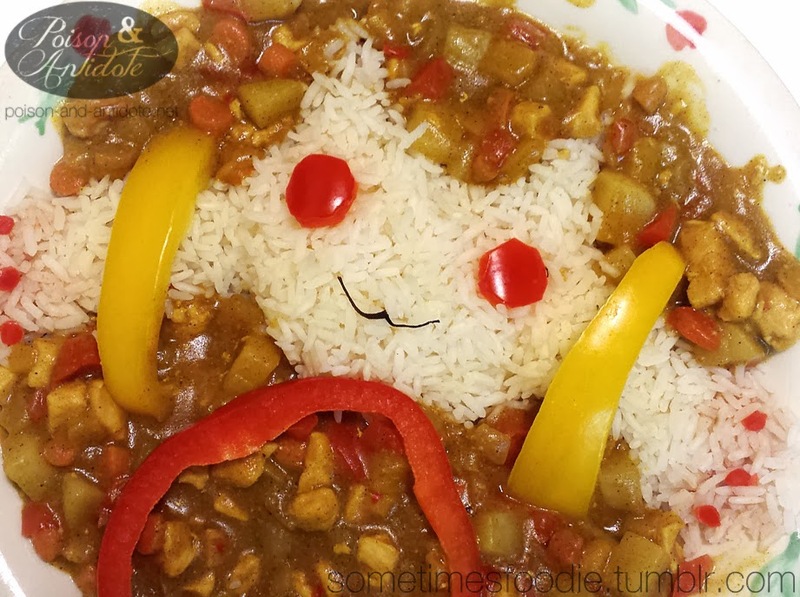 Above, is an image of the curry from the official Madoka cafe back in 2011. Basically it's curry poured into a shallow dish, topped with molded rice and a few edible accents. That doesn't seem too hard, but I feel like the cafe version was a bit....weak? I knew I could do better. I started by making a simple curry with my boyfriend, due to what we had on hand, we went with a basic chicken and vegetable curry. (We used: Golden Curry cubes, diced chicken, 1 potato, 1 onion, 1 yellow and 1 red bell pepper and a few carrots.) Everything was finely chopped and diced because I wanted the rice-Kyubey to be the boldest thing on the plate. While the curry cooked, I started working on all the little edible accents. After the curry was prepped, we used a rice cooker to make a batch of white rice. Sadly, it came out a little dry, but I was still able to work with it. To make Kyubey's face, the official cafe used a mold. Well, I don't have one, so molding it by hand turned out to be the toughest part of the whole process. I used a large soup ladle as a form for the head, but the ears were sculpted entirely by hand using a wooden spoon. After all was said and done, the molding by hand process wasn't too difficult, but I'm sure it would have been a LOT easier with a mold. In the future I'll add more water to our rice so molding the Kyubey will hopefully be even easier. 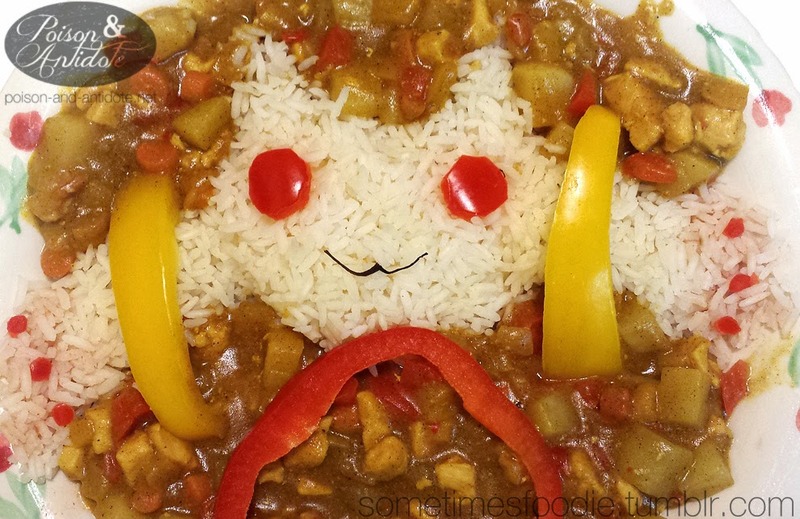 After our curry was topped with a rice Kyubey it still needed a little something. I didn't like how generic the official cafe version looked, so I took a step further and tinted the rice at the tips of the ears pink. To do this I used a mixture of sriracha and red wine vinegar. Personally, I liked the tangy flavoring, but those of you trying this at home might want to stick to food coloring and water. Last but not least, this little jerk guy needs a mouth. I think the cafe version used nori, but I didn't have that on hand, so we used two tiny tea leaves. The little tea leaves didn't affect any of the flavoring, but they did add a crunchy texture. If you have nori around, I recommend using that, but I will say tea leaves work in a pinch. Overall, I'm pretty happy with the finished product. Next time I might make a beef-style curry with less veggies and more broth, so the finished product will be darker and less distracting. I'd also cut the yellow pepper rings a bit thinner. Still, I think this was a really successful cafe reproduction. I plan on doing a few more in the future.